Hot Won Ton Bites | What's Cooking at the Genua's? Well this past week I decided to finally venture into the won ton appetizer realm. I have to say it was a huge success! These little wrappers are so cute! I made two different ones and the were both a huge hit. The main recipe I used was spinach and artichoke. I got the recipe originally from Kraft Foods and tweaked it. It called for red peppers. Everyone knows I don’t like sweet peppers so I used sun-dried tomato as well. 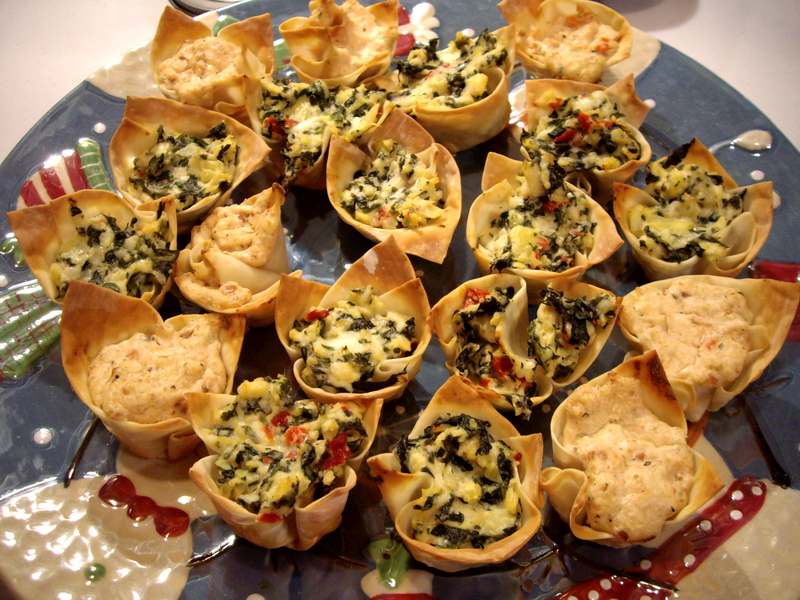 If you want the original “Warm Spinach & Artichoke Cups” click and check it out. The second one I made was a sausage/cream cheese combo. I had two large Italian style chicken sausages and just ground them up and added cream cheese. HUGE HUGE HIT! The won ton wrappers can be found in pretty much every supermarket. Look in your produce section by the Asian foods. The ones I used are the small square ones. Have fun with these because you can put just about anything into them and bake them! Experiment and have fun! I know I’m getting another package next time I go shopping! And make sure you have at least 2-3 mini muffin tins for these. You can use one but it will take longer. 1. Heat oven to 350º. 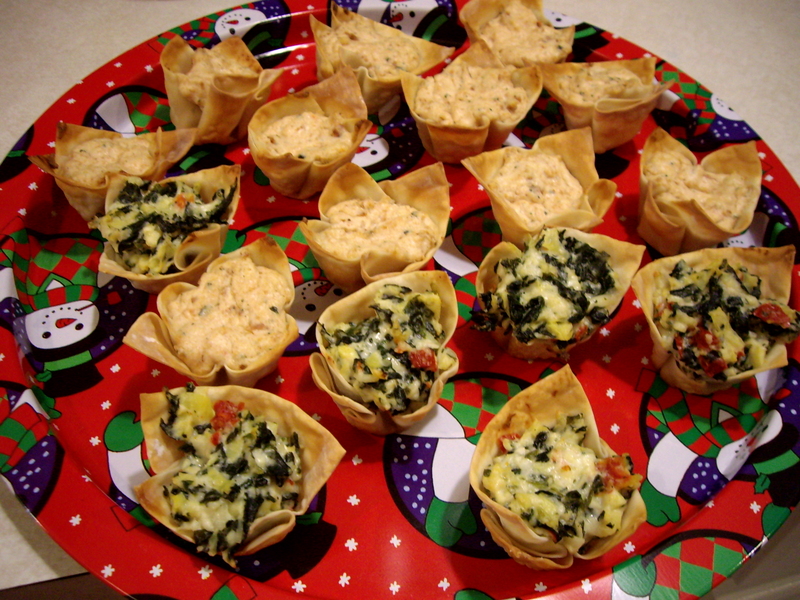 Place 1 won ton wrapper into each of 24 mini muffin cups sprayed with cooking spray. Make sure the edges of wrappers extend over the top of cup. Bake 5 minutes. Meanwhile combine the rest of the ingredients. 2. Once the 5 minutes is up remove from oven. Spoon the mixture into the cups. 3. Bake 12-15 minutes or until filling is heated through and edges of the cups are golden brown. They may need an extra minute or so depending on your oven. Just keep an eye on them. Enjoy! Thank you so much for the great comment Mary! I appreciate it! I have been making more of these little bites too! I’ll have a few more variations in future blogs. You also inspired me to get back to my blog more often then I do now. Thank you! And give them a try, you’ll love them!